China has launched two new satellites yesterday (July 25, 2015) for the nation’s Beidou Navigation Satellite System (BDS). 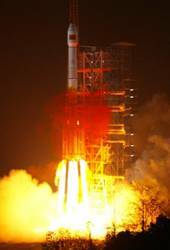 The satellites were launched from the Xichang Satellite Launch Center, in southern China. They’re the 18th and 19th to join the satellite navigation system. The two satellites reached their target orbits three and a half hours after the launch, according to the Xinhua news agency. Xinhua said the spacecraft will be used to test the new BeiDou Phase III navigation signal and inter-satellite links. As previously reported, in the current and final phase of system development now under way, China will migrate its B1 open civil signal from 1561.098 MHz to a frequency centered at 1572.42, which has become a common band for current and future GNSS signals, including the GPS L1 and L1C and Galileo’s E1. The signal modulation will also change from a quadrature phase shift keying (QPSKZ) modulation to a multiplexed binary offset carrier (MBOC), similar to L1 and E1 but with some unique characteristics. The satellites, which may have middle Earth orbits (MEO), are the second and third new-generation BeiDou spacecraft placed in orbit by China, following a successful launch in March. In an interview with the Shanghai Daily published today, Xie Jun, chief engineer of the Beidou project, said the “twin sats” are designed to be “trail blazers” as the BDS expands its coverage globally. The launch was the first employing the new Expedition-1 (Yuanzheng-1) upper stage, capable of placing satellites directly into GEO or MEO orbits. Xie also told the publication that 98 percent of the two satellites’ components were domestically made, including the rubidium atomic clocks on board, and that the spacecraft has a projected life expectancy of 15 years. BDS began providing services to civilian users in China and surrounding areas in the Asia-Pacific in December 2012.